There are lots of types of barcode, so whenever you need to add some new type to PDF Splitter just write to our support team. CoolUtils developers are at your disposal to create the program exactly the same you need. REemember to send us a couple of sample PDF files with barcodes so that we could come up with teh estimate. By purchasing this program you get not only the possibility to construct it under your needs, but a ready-to-use multifunctional tool with various options and possibilities. 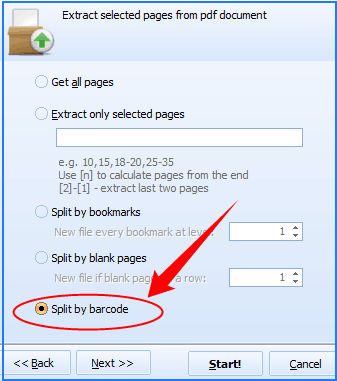 PDF Splitter works with PDF-file in different ways: extracts all pages, odd/even pages or only selected pages, splits files by bookmarks or blankpages, combines split pages. And now offers splitting by barcode as well. Download and enjoy free trial version, or just buy the license version.